Hear the one about the English team, Welsh team and Irish team? They all won their ties in Saturday's Scottish Challenge Cup. The last 32 of the competition for lower league Scottish teams - well, lower league plus under-21 sides from the Premiership clubs - was played out on Saturday. A day on from being appointed St Mirren manager, Oran Kearney took in the Buddies' colt team's 3-2 win over Hamilton Under-21s then returned to Northern Ireland to say his farewells at Coleraine. His old team beat Formartine United on penalties after a 1-1 draw - but only just with only three kicks converted, two in Coleraine's favour. There was also spot-kick drama in Oswestery. The New Saints, semi-finalists over the past two seasons, were a man down and a goal down deep into stoppage time but levelled to force penalties only to lose 4-2 in the shootout. In the other evening kick-off, Sligo Rovers' Michael Drennan scored a hat-trick in a 4-1 home win over Livingston, meaning only St Mirren and Motherwell have under-21 sides in Tuesday's third-round draw. Eastenders is filmed near their ground, and so too - in the late 1970s - was The Muppet Show. English National League side Boreham Wood provided their own Albert Square-style cliffhanger ending against Dunfermline on Saturday - and perhaps left their chairman feeling a bit of a muppet. Visitors Dunfermline took a healthy support of around 500 to the Hertfordshire town, travelling south via train, plane and road. They watched their team score their first six spot-kicks before Connor Smith's effort hit the bar for the hosts. 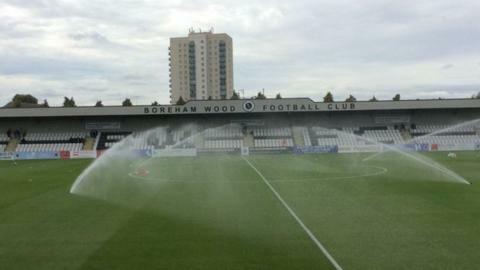 And to think the afternoon had promised so much for Boreham Wood. Chairman Danny Hunter posted an emotional message on his club's website in the build up, talking about the excitement of facing the "mighty" Dunfermline in the "Scottish Cup" with the chance to play a final at "Hampden". The venue for this season's final has yet to be announced - but it has only been played at Hampden once in its 27-year history. Sadly for Hunter and his tenuous grasp of details, his dreams of a final anywhere in Scotland this season are over. Sutton United fans faced an arduous 844-mile round trip to Airdrie. One, Alain Desmier, will eventually return home to south London with stories of tattie scones and cans of Irn Bru, as well as a 1-0 win for his team over their Scottish League One hosts. Sutton can now look forward to a likely return trip, as could Republic of Ireland side Bohemians and Connah's Quay Nomads of Wales after both secured 1-0 wins over Peterhead and Falkirk respectively. Raith Rovers have had a bad week, with Barry Smith's resignation as manager followed by the loss of five first-half goals in a 5-0 defeat by Ross County. But even they could probably spare a thought for Partick Thistle. The Firhill side have won just twice in the league, and even their victory over Morton last week was soured by a 'ghost goal'. And now they have now gone out of the cup to the side who are bottom of League One, despite taking the lead away to East Fife. That led to Thistle's twitter being bombarded by angry fans baying for manager Alan Archibald, who said his side "got what we deserved". Blowing a two-goal lead in football tends to sting. Letting slip a three-goal lead is embarrassing. Throwing away a four-goal lead is rare, but Queen of the South almost did it. Stephen Dobbie continued his stunning start to the season for the Championship side, taking his tally to 20 in 11 games after notching two in the first half against Northern Ireland's Crusaders. By the break, Queens were 4-0 up. But two goals in two minutes made it interesting. Then Paul Heatley added a third with five minutes to go. Crusaders though could not find a fourth for their 126 travelling fans.